Biscoff Stuffed Snickerdoodles - Hi, friend Popular Recipes, in this article entitled Biscoff Stuffed Snickerdoodles, we have prepared this article well and concise to be easy to understand for you to read and can be taken inside information. hopefully the contents of the post Article baking, Article baking challenge, Article Cookies, Article food, Article recipe, that we write this you can understand and useful. okay, happy reading. As some of you have probably noticed, my latest obsession is Biscoff spread. I absolutely love baking with it! So when Julie announced that the next Willow Bird Baking challenge was all about stuffed cookies, I knew exactly what to make (thanks to my mom who had just recently made snickerdoodles, both Stephen and I were craving them). I adapted a snickerdoodle recipe from Julie's blog and filled them with a Biscoff cream cheese mixture. I rolled them in cinnamon sugar, placed them on a baking sheet and tossed them in the oven. After about 10 minutes of baking the kitchen smelled heavenly... oddly enough a bit like apple pie (hmm... maybe for next time?). Just after they had cooled I cut into one, took a bite and realized that this may just be my new favorite thing. These snickerdoodles went from ordinary to extraordinary with just a little scoop of Biscoffy goodness. Two more? Yes please! 1. Preheat oven to 350 degrees. Line 2 baking sheets with parchment paper, set aside. 2. In the bowl of a stand mixer, combine butter, oil, milk, and sugars. Beat until smooth and creamy. 3. Add egg and vanilla extract, mix until just combined. 4. In a medium size mixing bowl, combine flour, baking soda, cream of tartar and salt. Whisk to combine. With mixing speed on low, gradually add mixture to the wet ingredients. Mix until just combined. Remove bowl from stand and chill dough while preparing the remaining parts. 5. In a small mixing bowl, combine all filling ingredients. Using a rubber spatula, mix until all ingredients are incorporated. Place in refrigerator to chill for 15 minutes. 6. In a small bowl, combine cinnamon and sugar. Whisk to combine, set aside. 7. When dough and filling are sufficiently chilled, remove from refrigerator. Using a standard size cookie scoop, form balls of dough. Break each ball in half and pat to make a flat circle. Place a quarter size ball of dough on one flat circle, then top with plain flat circle. Press the edges and form a ball in the palm of your hands. Roll into cinnamon sugar mixture and place on a prepared baking sheet (you should get 12 to a sheet). Continue the process until the remaining dough/filling has been used. 8. Place in oven and bake for 12-14 minutes (these cookies will not brown, they will just get crispy so don't over bake them). Remove from oven and allow to cool on sheets for 3 minutes. Transfer to a wire rack to cool completely. 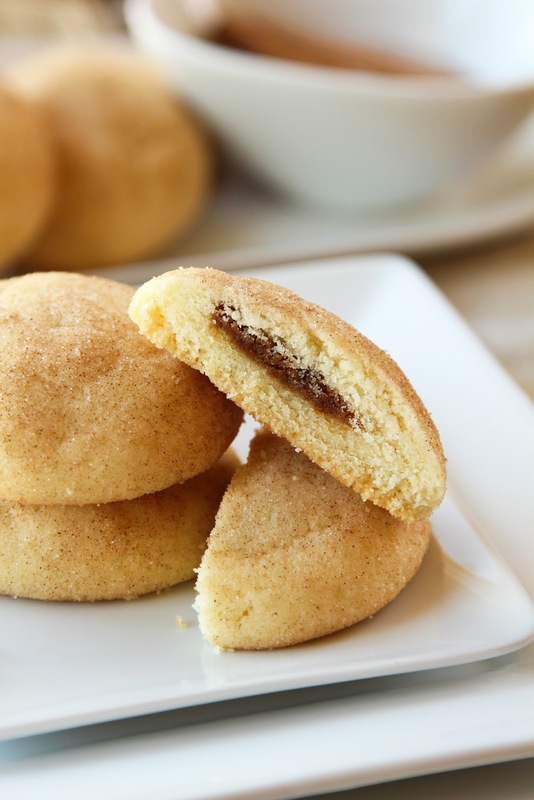 Thank You and Good article Biscoff Stuffed Snickerdoodles this time, hopefully can benefit for you all. see you in other article postings.